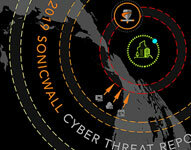 The 2019 SonicWall Cyber Threat Report. You may not be surprised to learn that if a network, identity, device or data are of value, cyber criminals will identify, target and ruthlessly attack. They do not discriminate against small, medium or large organisations anymore. To promote global awareness and facilitate important dialogues, SonicWall remains steadfast in its commitment to research, analyze and share threat intelligence. Download the 2019 SonicWall Cyber Threat Report here. A sneak peek into the report and it is very clear that Cyber Threats are very alive and kicking. This comprehensive 33 page report unmasks the threats that target global enterprises, governments and small to medium businesses. Granted that this report focuses on the USA market, it is a valuable insight into a much large global picture. 2018 was riddled with breaches at major companies, brands, services and government agencies. Breaches at Exactis (340 million records), Under Armour (150 million), Facebook (in April and September for 137 million total records), Quora (100 million), MyHeritage (92 million) and Panera (37 million) all grabbed headlines with data thefts that soared above 35 million records. You will find an abundance of stats, graphs and explanations of ransomware attacks, Zero-Day vulnerabilities, cryptojacking, phishing emails and much more. The intelligence for the 2019 SonicWall Cyber Threat Report was sourced from real-world data gathered by the SonicWall Capture Threat Network, which securely monitors and collects information from global devices and resources. There seems to be one common thread while reading this report, cyber-attacks and breaches are on the rise and getting more sophisticated by the day as cyber criminals change direction and tact to breaching businesses all over the globe. It is imperative that businesses take the new security threats seriously. In fact, SonicWall Capture ATP identified 391,689 new attack variants in 2018 — an average of more than 1,073 new attacks discovered and blocked each day. This marks a 118 percent increase over 2017, when Capture ATP averaged 493 new variant discoveries a day. It is a fact, that the security landscape has changed and having a layered approach is the only way businesses can ensure they are protected.